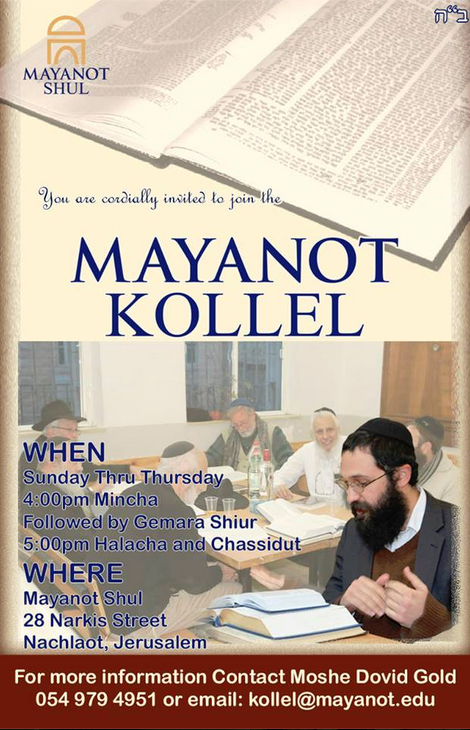 Mayanot Shul in Nachlaot, is excited to announce the new afternoon Kollel. Open every Sunday through Thursday, with a Gemara shiur followed by Halacha and Chassidut, presented by Rabbi Mordechai Guth. The grassroots project was initiated by community member, Moshe Dovid Gold, l’ilui nishmat his late wife, Shulamit, and has had widespread success since its launch, last month. Mayanot Shul presently offers many programs and opportunities for young adults and college students and therefore wanted to branch out and afford the adult community with learning opportunities, as well. Many gathered for the opening fabrengen in honor of the Kollel’s inception, which attests to the need and desire for such programs in the community. Mayanot hopes the Kollel will enhance the overall community experience and inspire many to deep Torah learning. The Kollel includes: classes, fabrengens, open chevrusa time and discussion forums, for two hours, daily. All are welcome and encouraged to come Celebrate, Learn, and Share Torah.